Meta Watch launches its new Smart Watch featuring Bluetooth 4.0 wireless technology for connectivity and compatibility with iOS and Android devices. we already mentioned about top 6 smart watches ,Till now we are observing battle among Smart Phones now it's time for Smart Watch. 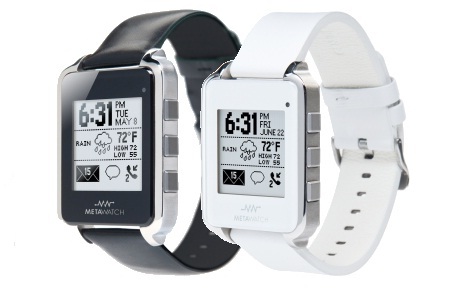 MeatWatch include Bluetooth 4.0 wireless technology expanding connectivity to leading Bluetooth 4.0 capable devices starting with the iPhone 4s, iPad(3) and Android.The Meta Watch platforms utilize embedded Bluetooth technology to connect to smartphones, mobile devices and other Bluetooth enabled devices. Compatibility: iPhone 4s (iOS 5 and up), most devices with Android OS 2.3 and up. I think we are going to see more companies in Smart Watch Industry.